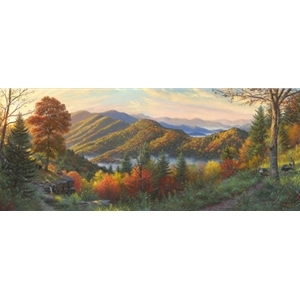 Introducing, Newfound Memories -- a painting commemorating the 75th anniversary of the Great Smoky Mountain National Park. I had been to Newfound Gap last October when the fall colors were eye popping and happened to take several photos. What a place! But as usual, the photos just didn't capture the scene. And to my slight irritation, neither did the painting I did. Yeah it was a nice painting, but it lacked the grandness that was in my memory. So I tried again... painting another 24x30 painting... determined to make this one work. Well, midway through, I was comparing the two, and asking visitors to my studio which they liked better. 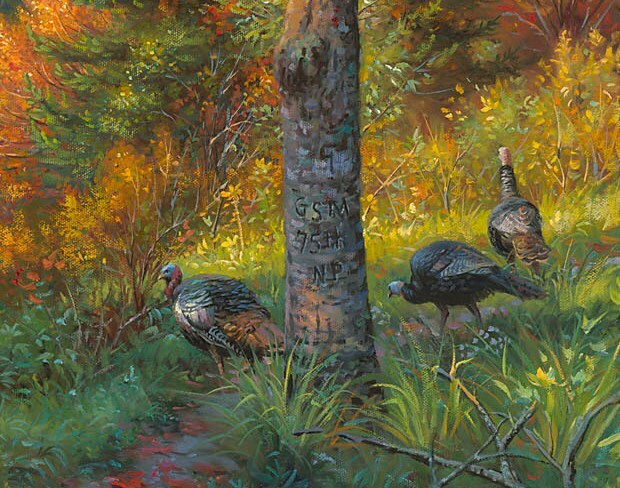 One afternoon, we had them sitting side by side and "Wow!" There it was! The two paintings fit together like one. (I had to make a few minor adjustments, but together it captured it! Because of this, we are releasing 3 prints from these two paintings. One "Left", one "Right" and one Panorama of "Newfound Memories"... one of the most famous vistas in the park going over the pass from Tennessee to North Carolina. - - Having too much fun!